Spring came slowly to Chicago, with a whistle of winter from the Great Lakes and the sorrow of a crop-hauler’s summer. At the Olympic Theater, stagehands cranked and the curtain lifted. Hands that had chopped wood for six months—hands rough with labor and freezing rain—tipped jiggers of bourbon to scabbed lips. The wooden seats—some rowseats, some benches, some chairs set around tables—had been burnished by wool, by oilskin, by leather, and by the expectations of audiences who wanted something for every cent they spent—because every cent they’d earned they’d torn out of the world, or themselves. J. W. Kelly, the headliner for the evening, had travelled the country for 20 years—trying to make these people laugh. That April day, Kelly stepped out from behind the curtain in his characteristic, all-black ensemble—spectacles, top hat, and frock coat. The bits were reported, familiar: “Kelly, Have You No Shame at All;” “The Milwaukee Fire”; “Songs My Mammy Sang.” As he lumbered forth to the accompaniment of his entrance music, “The Wearing of the Green,” the house was ready, waiting for him. A chimney sweep for their burnt spirits. Oh, Paddy dear, an’ did you hear the news that’s goin’ round? For there’s a cruel law against the wearin’ of the green! The men with hats turned down in their laps (lest they be utilized as spittoons), the boys tossing peanuts, the serving girls in tassels and high boots—you won’t find the tombstones, but these were our ancestors. They weren’t all criminals or thugs or prostitutes or men with razors in their boots, but some of them were, more perhaps than any of us would be comfortable admitting—and this wasn’t church Sunday. Gaslights, cigar smoke, and beaver-felt hats, Kelly regarded the crowd. His eyes were swollen—only a moment before, one of the wrestlers had shaken him awake. Not one of the real wrestlers; the duty had fallen to the challenger, the bumpkin who’d come to Chicago to sell his pigs and thought he could stand with a champion. Two champions. Jack Carkeek and Evan Lewis. Back to back. The dumb hick had worn his overalls. In Carkeek, the bumpkin faced a lifelong practitioner of Cornish Wrestling, or “wrasslin” as it was called in Cornwall England, where Carkeek’s father and grandfather had mastered the roughneck style. Carkeek was sizable for the day, 185 pounds, and for six years he’d been traveling the globe, beating bumpkins for prize money. Since an 1887 loss at Chicago’s Battery D’Armory, he’d assumed a place in the upper ranks of the fight business, training alongside and taking marquee matches against the best in the world. The Chicago bout, against none other than Evan Lewis, decided the first recognized professional heavyweight wrestling championship in the United States. The referee called the match; drained of strength, Carkeek was bleeding internally. As “The Miner,” Carkeek had played his customary role as the “honorable man,” and if his reputation wasn’t menacing enough to scare off bumpkins, or sell out the last row of the Olympic theater, he nonetheless took the edge off the Evan Lewis contingent; Lewis attracted an audience, but a cruel, bloodthirsty audience—because Lewis was a cruel, bloodthirsty fighter. If the bumpkin withstood Carkeek, his reward was a match with Lewis, “The Strangler,” the American Catch-as-Catch-Can Champion, and the American Heavyweight Wrestling Champion. 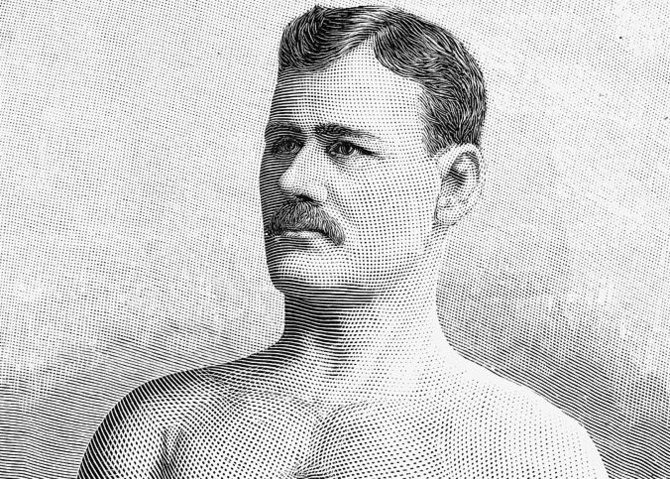 “The Strangler” had beaten everyone—Joe Acton, William Muldoon, Tom Canon, everyone—and not only did he beat his contemporaries, he frightened them, using a full inventory of styles: London Prize (bareknuckle fighting), Catch-as-Catch-Can, Greco-Roman, “mixed” (meaning to say the rules were negotiated) and “go as you please” (meaning to say the rules were unwritten). Lewis’ game would be familiar to today’s mixed martial arts fans; though he specialized in the ground attack, he didn’t mind exchanging blows. In an era when matches were not stopped short of injury, Lewis would commonly emerge victorious via broken bone, torn joint, or crushed windpipe. Lewis’ signature technique, and namesake: the strangle. In 1886, he strangled Matsada Sorakichi until the famed rib breaker’s eyes rolled into his head and he was regurgitating blood. In the rematch, with the chokehold banned, Lewis had promised, “I will not choke you this time, but I will screw your leg off.” Under a minute, and he did just that. The bout made the front page of The New York Times. The injury, the Times reported, reached from ankle to knee and was far worse than a break—joints, ligaments, and muscles were shredded. In 1887, Lewis had destroyed “Stompin’ Tom” Connors, a master of the Lancashire style (a precursor to Catch-as-Catch-Can) who was direct from the source, England. Lewis, perhaps not seeing straight wrestling as his best strategy, had punched, head-butted, kicked, and choked Connors into a limp-limbed doll. It didn’t seem to bother Lewis that the match ended in his disqualification. For a hobby, and sort-of half-time act, Lewis juggled 250-pound Indian clubs. J.W. Kelly, as one of the highest-paid variety performers of the day, offered a whole show, an evening of edification: prize fighting and wrestling were standard variety-show offerings, as were more exotic confrontations, like Sumo. With his gruff, no-nonsense persona, Kelly opted for the wrestling. Wrestling was an American pastime (of the first 16 presidents, six of them, including George Washington, John Adams, Andrew Jackson, and Abraham Lincoln, were wrestlers), and a red-blooded American man knew that fighters didn’t wear padded mittens and that the takedown was the fundamental act of a fight. Parson Davis, Lewis’ manager, had issued the public challenge, placing ads in Chicago papers and sending boys into the streets with handbills and posters: Two-dollar entrance fee. Fifteen minutes with Carkeek, followed by fifteen minutes with Lewis. If the challenger remained standing against both men, he would be awarded $25—which was equal to a month of 18-hour-a-day manual labor. The challenger was also entitled to “sides,” i.e., wagers he made on his own, which could bring his stake into three figures, a substantial sum. Davis had sought to attract a name contender. It was the barnstorming way: The challenge turned out the talent, which drew the ballyhoo, which drew the crowd. But the bait proved wanting; surviving Carkeek to face Lewis, it was just too horrific. Lewis liked to hurt people. Without a recognized foe, Davis was inclined to scratch the event, which had become more trouble than it was worth—but there was this one problem: this hogman who’d paid his two dollars, who wouldn’t back down. Davis made sure the fellow understood: one wrestler then the other. The bumpkin said he was in town for 10 nights, and any night would do. Kelly—assuming the wrestling would be a disappointment, or thinking to creep back to his box for another few minutes’ sleep—decided to wait on the monologue and start with the bumpkin. He returned his chair to the wings, asked Parson Davis for the hogman’s name, and sauntered back to the footlights. “A farmer!” said Kelly’s lead musician, going with the gag. With Kelly’s punch line, in jumped the piano: Entrance Music for a Yokel. But the crowd didn’t get it. Not until Martin Burns--“The Farmer,” as the papers would dub him--stepped out, haltingly, from behind the curtain. Overalls, stage-fright, and laughter in the house, Martin “Farmer” Burns, trembling in his clodhoppers, gazed out at the crowd, at the eyes he found in the oily dark. The eyes of that hour, that night at Chicago’s Olympic Theater, but also the eyes of a nation, and history abiding. Parson Davis then ushered forth his champions--first Carkeek then Lewis, arms crossed, strong-man pose, terrifying.